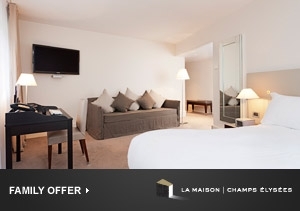 La Maison Champs Élysées is conveniently located in the center of Paris, roughly 40-minutes from Charles de Gaulle International Airport. Some hotels have a special effect on guests… perhaps they are situated in unreal locations, designed in an incredibly imaginative way, or decorated with such style, class, and whimsy that one can’t help but be swept away by fantastical thoughts and pure pleasure. Either way, La Maison Champs Élysées is such a place. When deciding which style of accommodation would suit one best, guests have a choice between the “Boutique Collection” of 40 renovated rooms, and the Couture “Collection” of 17 rooms and Suites designed by Martin Margiela. Every space at La Maison Champs Élysées is playful and fun, the result of a whimsical combination of classical and avant-garde styles. Do not be surprised if the meals at Restaurant & Bar La Table du Huit are some of the best in Europe. The White Lounge, The CigarBar, The Patio, The Terrace and Garden are also all fantastic places in which to drink and dine. 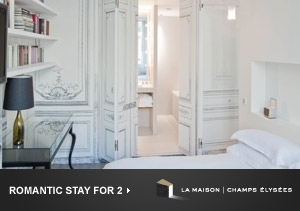 For a magical, chic Parisian experience, La Maison Champs Élysées is the place to stay. 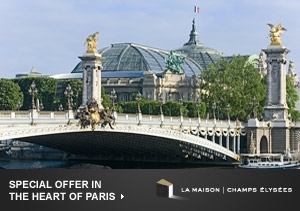 Send an availability request with your requested dates to the La Maison Champs Élysées.